This guest post is courtesy of Roy Gross, Chief Officer of the Suffolk SPCA. The phone call came in the morning - NYPD frantically asking for our mobile animal hospital. Would we come to the city immediately? Please bring all available supplies and personnel. A disaster of untold proportions.Chaos and devastation everywhere. We set up our MASH unit as close to the site as we could. We grabbed medical supplies and climbed through the debris and falling ash to provide mmediate first aid to the search and rescue dogs and their handlers. ﻿﻿Our SPCA volunteers, as well as the veterinarians who arrived, responded without hesitation. They faced unspeakable horror and showed incredible courage, sacrifice and patriotism. 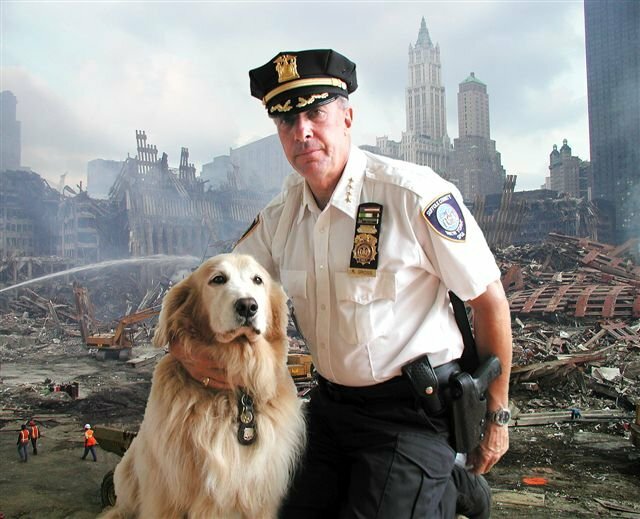 All kinds of dogs responded to Ground Zero - all shapes, sizes & breeds and with various job descriptions including search & rescue, cadaver, bomb dogs and even comfort therapy dogs. Some of the ailments suffered by the dogs were severe dehydration - they had to be rehydrated intravenously. We provided booties for their paws that were cut up by the sharp debris or burned from the smoldering ruins. Their eyes had to be irrigated with saline solution because of pollutants in the air. Their ears had to be cleaned-their bodies washed and decontaminated-cuts had to be sutured, scrapes and abrasions attended to. Yet they endured and kept on working like the true soldiers that they are. During the grueling 8 weeks that the Suffolk County SPCA was at Ground Zero we provided almost 1,000 treatments to the more than 300 courageous K-9's that came from all over the country. We even provided first aid to their handlers. We also helped civilians retrieve their pets from the evacuated apartments. Our peace officers escorted them from Pier 40 to their homes, brought them to our MASH unit for medical evaluation and returned them back to Pier. The brave dogs and handlers that worked at Ground Zero faced immense danger during that horrific time and one thing has been proven to all of us-that these courageous canines-in the best of times and in the worst of times are truly man's best friend! The Suffolk County SPCA is a 501(c)(3) volunteer agency consisting of over sixty non-paid individuals from all walks of life. Our peace officers are both active and retired law enforcement personnel who enforce the New York State Agriculture and Market Law with regard to the prevention of mistreatment and cruelty to animals. The Suffolk County SPCA is funded entirely by charitable donations. Our existence depends upon your generosity, as we do not receive funds from the State. Your gifts to us are tax deductible. Suffolk County SPCA Board of Directors: Roy Gross, Dr. Gerald Lauber, Herbert Kellner, William Wexler, Lois Gross. Advisory Board: Sheriff Vincent DeMarco, Ret. Police Commissioner John Gallagher, Wendy Diamond. Veterinary Advisory Board: Dr. John Charos, Dr. Dennis Dougherty, Dr. Barbara Kalvig, Dr. Michael Shorter. This year, there are numerous events and memorials happening on Long Island tomorrow to honor those that were lost on September 11th, 2001. To find out more, click here. In the feature photo: Chief Roy Gross, and Cody. Graduates of 2008 - the Future Needs You! Ten Steps of Crisis Communications--Are You Ready? Subject: LongIsland.com - Your Name sent you Article details of "The Suffolk County SPCA At Ground Zero - Local Heroes Respond During Time of Crisis"